3 Bedroom Detached House For Sale in Templecombe for Asking Price £319,950. A delightful, three bedroom detached family home situated in a cal de sac location on the outskirts of the popular village of Henstridge. The property benefits from spacious, well proportioned accommodation that can be manipulated to suit many lifestyles. This includes: a welcoming entrance hall, light and airy Living room, spacious Kitchen and Utility room; with three Bedrooms to the first floor, En-suite to master and a family Bathroom. There is a landscaped rear Garden backing onto playing fields as well as a good size Garage and drive way providing ample parking. A spacious entrance hallway entered via a part glazed UPVC front door. With under stairs storage cupboard and doors to Living room, Dining room, Kitchen and WC respectively. A light and airy room with a feature fireplace, double glazed window to front and radiator. With sliding doors opening into the rear garden and radiator. Fitted with wall mounted and base units, with work surfaces over, stainless steel sink and drainer and space for washing machine and tumble dryer. Double glazed to rear and door the the rear garden. With internal door to Garage. Wall hung wash hand basin, low level WC and radiator. With obscured window to front. Loft hatch access and airing cupboard housing hot water tank and fitted with associated shelving. Doors to all Bedrooms and Bathroom respectively. Walk in shower, pedestal wash hand basin, low level WC and radiator. Obscured window to side. Large double room with built in wardrobe, double glazed window to rear and radiator. Suite comprising white ceramic wash hand basin, low level WC with concealed cistern, and panelled bath. With obscured window to front. A good size single Garage with up and over door, fitted with lighting and power. A gravelled frontage bordered with various plants and shrubs. 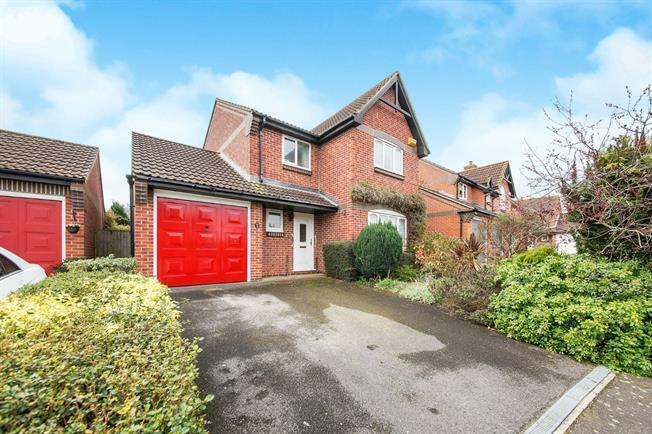 Driveway providing ample parking and side gate access to rear Garden. A sunny aspect, landscaped rear Garden, planted with various small trees and shrubs, mostly gravelled with a paved seating area.